Born James Miller (he changed it to the legendary MacColl later), Ewan MacColl was not just a noted British traditional folk songwriter; he was also a labor activist, playwright, poet, actor and record producer. At the time of his 1989 death at 74, his best known song in America (out of more than 300 he composed) was one he wrote but never sang. Roberta Flack’s version of “The First Time Ever I Saw Your Face” was written for his third wife Peggy Seeger, but it didn’t elevate his name in the States, a country from which he was banned due to his Communist viewpoints. So it comes as a bit of a surprise that this double-disc package, assembled by his three children from Seeger on what would have been his 100th birthday, is the first official attempt to honor his influential work. Perhaps not surprisingly, the bulk of the artists performing MacColl’s material on this 21-track, predominantly acoustic set originate from the U.K. The most obvious exception is Steve Earle, also the highest profile name, at least to those in the States. The result is a lovingly-compiled, largely-traditional anthology of tracks recorded specifically for this album. All the artists are reverential to the songs, perhaps overly so, and play them with measured, restrained respect, clearly what MacColl’s children, who executive produced, mixed and designed the project, intended. But without unique interpretations, these versions will do little to spark the enthusiasm needed for newcomers to MacColl’s largely esoteric catalog, to transform into fans looking to explore his music further. No one is expecting, or would want, hip-hop, hard rock or psychedelic readings of tunes that don’t lend themselves to radical re-arrangements. Still, a few more recognizable international stars — the biggest names are Earle, Billy Bragg, Pulp’s Jarvis Cocker and David Gray — would draw eyeballs to the project and spark crossover response. That doesn’t diminish the quality or beauty of what’s here. Those willing to explore will find moving renditions of songs such as “The Young Birds” and a heartbreaking solo “My Old Man” from Chaim Tannenbaum, an emotionally gripping track about MacColl’s father that seems autobiographical. The album is a classy, enlightening homage to the legendary songwriter who surely could use overdue recognition. But unlike Bruce Springsteen’s similarly rootsy and far peppier tribute to Pete Seeger, this fine ballad heavy collection probably won’t attract the attention its compilers are hoping for and garner the posthumous stateside appreciation MacColl deserves. 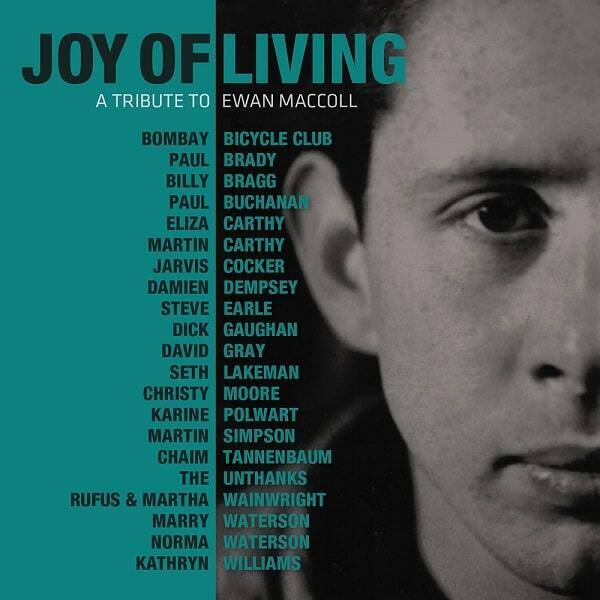 To hear Billy Bragg’s cover of Ewan MacColl’s “Kilroy Was Here” from Joy of Living, click here.